The new book from DiA’s Nic Cheeseman and Brian Klaas has been making headlines, with a front page cover story for the Spectator and a lively podcast. Find out how to rig an election, and why counterfeit democrats are able to remain one step ahead of election observers. 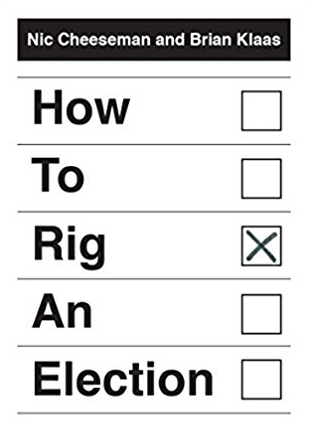 Professor Nic Cheeseman’s new book, How to Rig an Election, is now available from Yale University Press. To purchase a copy at a discounted price visit Amazon now. Coinciding with the Cambridge Analytica controversy, the book’s publication was celebrated with a front page cover story for The Spectator magazine, in which Cheeseman and Klaas call for a parliamentary enquiry into the activities of companies like Cambridge Analytica both at home and abroad. This marked the first time in its history that The Spectator has given its front page coverline over to the title of a book. Click here to read the story. The story also inspired a podcast on the same theme, in which Cheeseman and Klaas share stories of election rigging around the world, and discuss what can be done about it. To listed to the podcast, click here. Previous articleCrisis? What crisis? Everything is fine in Zambia!